Anne Thompson weighs the pros and cons of the 2018 Oscar frontrunners, and comes down on the side of Amphibian Man. This year, it looks like the five DGA feature film director nominees could match up with the top five Best Picture Oscar nominees. Assuming that’s true, which movie is running ahead? Let’s break down their followings. “Dunkirk” is a $100-million spectacular World War II epic with appeal to men from action filmmaker Christopher Nolan (“Inception”) who is eager to finally earn his first directing Oscar nomination. Guilds: PGA, DGA, ACE, ASC, and ADG. Harmful meme: Why hasn’t it gotten more awards attention so far, like SAG? It’s landed nominations from the Globes, BAFTAs, and Critics Choice, but so far no wins. It lacks dialogue (so did “The Revenant”) and meaty characters. It’s radical that way, which is a good thing (it scored $505 million worldwide) and a bad thing (many Academy members demand conventional narrative). “Get Out” is a $4.5 million indie horror film with strong male appeal, written and directed by rookie African-American auteur Jordan Peele (Comedy Central’s “Key and Peele”), who surprised, challenged, and entertained audiences to the tune of $254 million worldwide. The movie is critically hailed, respected, and popular. And SAG, Golden Globe, Indie Spirit, Critics Choice and BAFTA nominee Daniel Kaluuya could land a Best Actor slot. Guilds: SAG Ensemble, WGA, PGA, DGA, ACE and ADG. Harmful meme: The genre movie lacks scale and scope and may not score multiple craft nominations. “Lady Bird” is a $6-million romantic dramedy (think mother-daughter drama “Terms of Endearment” meets coming-of-age comedy “Juno”) with strong female appeal from writer-director Greta Gerwig. Golden Globe Actress Comedy winner Saorise Ronan and Laurie Metcalf are multiple acting nominees. The popular indie has already grossed $37 million and shows no sign of stopping. Harmful meme: Men who don’t identify with the movie write it off as a small-scale Lifetime romance, and suggest that actress-turned-filmmaker Gerwig is winning awards only because she is a woman. 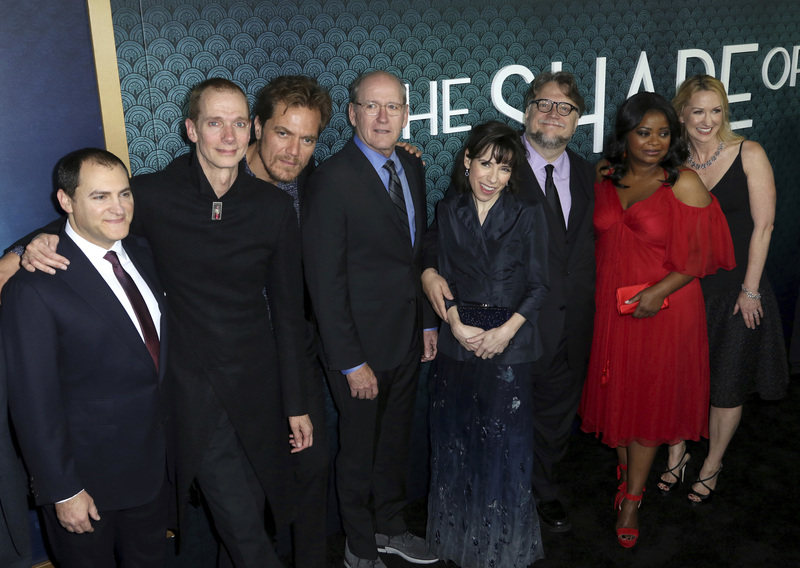 Michael Stuhlbarg, Doug Jones, Michael Shannon, Richard Jenkins, Sally Hawkins, Guillermo del Toro, Octavia Spencer, and Vanessa Taylor. “The Shape of Water” is a $19.5 million period-fantasy romance with strong appeal to both men and women from popular Mexican writer-director Guillermo del Toro, who took home Best Director from both the Golden Globes and Critics Choice awards, which awarded the film Best Picture. SAG, Globe and Critics Choice nominee Sally Hawkins is vying for Best Actress against frontrunner Frances McDormand (who keeps winning). Guilds: WGA, PGA, DGA, ACE, ASC, and ADG. The big-scale picture has strong support from the crafts. Harmful meme: The Cold War movie did not land SAG Ensemble (neither did “La La Land”). The romance between two outsiders, Hawkins’ mute cleaning woman and Doug Jones’ well-muscled Amphibian Man, leaves some human men cold. Distributor: Ace Oscar campaigner Fox Searchlight (“12 Years a Slave,” “Birdman”). “Three Billboards Outside Ebbing, Missouri” is a $12-million revenge drama set in the Ozarks from British playwright-filmmaker Martin McDonagh (“In Bruges”), whose stars Frances McDormand and Sam Rockwell have so far won Actress Drama and Supporting Actor awards respectively from both the Golden Globes and Critics Choice awards. No question actors and writers love this movie (it was ineligible for the WGA), which tellingly won the Toronto audience award. But it’s possible that Canadian moviegoers and the BAFTAs would embrace this movie perhaps more than the Academy. Guilds: SAG Ensemble, PGA, DGA, ACE, and ADG. Harmful memes: The movie’s shrill anti-heroine turns off some, along with an unsatisfying ending and the inauthenticity of a British writer skewering working-class Americans. Prediction: the movie with gravitas that ticks all the boxes in terms of equal male-female appeal plus scale and scope with support from both crafts and actors is “The Shape of Water,” an inclusionary fable about lonely outsiders who find love. And Del Toro could join his fellow Mexicans A.G. Inarritu and Alfonso Cuaron in the ranks of Best Directors.